Earn up to 3,016 reward points. A 500W powerhouse in a size you can toss in a backpack. Offering cutting-edge technology in a compact package that weighs less than 6lb., the MiniMax delivers 500 Watts of powerful, rich low end. With DDT speaker protection and Peaveys exclusive psychoacoustic low end enhancement that adds bass without overburdening speakers, the MiniMAX contains an impressive set of features and is available at a price accessible to todays working bassist. 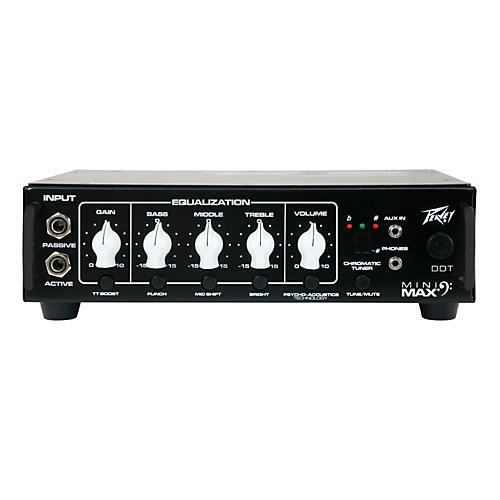 Featuring the rock-solid construction for which Peavey is known, the MiniMAX is built to withstand years of rigorous touring use. The convenient back panel of the amplifier has all the connectivity necessary to patch in effects or connect to a sound reinforcement system. Pair the MiniMAX with Peaveys Headliner or PVH series of bass enclosures to complete a reliable, ultra-lightweight professional bass system.